A sedan /sɪˈdæn/ — also saloon — is a passenger car in a three-box configuration with separate compartments for engine, passenger, and cargo. There is an unsubstantiated claim that the body of a particular 1899 Renault Voiturette Type B was the first motor vehicle that was a sedan. 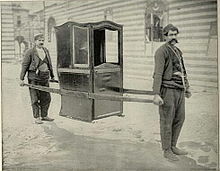 It was a two-door two-seater vehicle with an extra external seat probably for a footman/mechanic. In American English and Latin American Spanish, the term sedan is used (accented as sedán in Spanish). In British English, a car of this configuration is called a saloon. Hatchback sedans are known simply as hatchbacks (not hatchback saloons); long-wheelbase luxury saloons with a division between the driver and passengers are limousines. Super saloon is often used[by whom?] to describe a high performance saloon car where sports saloon would have been used in the past. Saloon has been used by British car manufacturers in the United States, for example, the Rolls-Royce Park Ward. In Australia and New Zealand sedan is now predominantly used, they were previously simply cars. In the 21st century saloon is still found in the long-established names of particular motor races. In other languages, sedans are known as berline (French), berlina (European Spanish, European Portuguese, Romanian, and Italian) though they may include hatchbacks. These names, like sedan, all come from forms of passenger transport used before the advent of automobiles. In German sedans are berlines or limousines and limousines are stretch-limousines. Several sedans have a fastback profile, but instead of a trunk lid, the entire back of the vehicle lifts up (using a liftgate or hatch). Examples include the Chevrolet Malibu Maxx, Audi A5 Sportback and Tesla Model S.
In 1973 the US government passed Federal Motor Vehicle Safety Standard 216 creating a standard roof strength test to measure the integrity of roof structure in motor vehicles to come into effect some years later. Hardtop production stopped in 1976-1977. For a time roofs were covered with vinyl and B-pillars were minimised by using styling tricks like matt black finishes. Stylists and engineers soon developed more subtle solutions. Close-coupled saloons originated as four-door thoroughbred sporting horse-drawn carriages with little room for the feet of rear passengers. In automotive use, manufacturers in the United Kingdom used the term for a development of the chummy body where passengers were forced to be friendly because they were tightly packed. They provided weather protection for extra passengers in what would otherwise be a two-seater car. 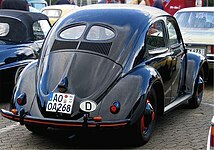 Two-door versions would be described in the US and France as coach bodies. A postwar example is the Rover 3 Litre Coupé. Models which have been called Sedanet or Sedanette include: 1917 Dort Sedanet, King, 1919 Lexington, 1930s Cadillac Fleetwood Sedanette, 1949 Cadillac Series 62 Sedanette, 1942-1951 Buick Super Sedanet and 1956 Studebaker. 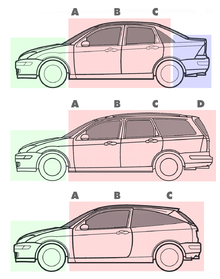 ^ "Car Design Glossary - Part 2: One-Box (Monospace or Monovolume)". Car Design News. Archived from the original on 3 December 2013. Retrieved 9 September 2015. The principal volumes of the traditional sedan can be split into separate compartments or boxes: the hood/bonnet is the first box; the passenger compartment the second, and the trunk/boot the third - i.e. it's a 'three-box' car. 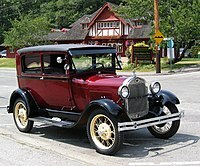 ^ "Where Does the Word "Sedan" Come From?". www.thenewswheel.com. 10 January 2017. Retrieved 25 November 2018. ^ "Definition of sedan in English by Oxford Dictionaries". www.oxforddictionaries.com. Retrieved 25 November 2018. ^ Duffy, James (2008). Auto Body Repair Technology (Fifth ed.). Cengage Learning. pp. 27–28. ISBN 9781418073541. Retrieved 9 September 2015. ^ a b c d e f Haajanen, Lennart W. (2007). Illustrated Dictionary of Automobile Body Styles. McFarland. ISBN 9780786437375. Retrieved 9 September 2015. ^ Morello, Lorenzo (2011). The automotive body - Volume I, Components design. Springer. p. 184. ISBN 9789400705128. Retrieved 9 September 2015. ^ "Starting Out: Car Design Glossary - Part 2". www.cardesignnews.com. Archived from the original on 3 December 2013. ^ "What is the difference between coupe and sedan?". www.chicagotribune.com. Retrieved 25 November 2018. ^ "Club Coupes". www.hemmings.com. Retrieved 7 December 2018. ^ "Coupe vs. Sedan: What's the Difference and Definitions of the Body Styles?". www.automoblog.net. 12 February 2009. Retrieved 7 December 2018. ^ "A Sedan or a Coupe? What's the difference?". www.middletownhonda.com. 31 July 2013. Retrieved 25 November 2018. ^ Morello, L.; Rossini, Lorenzo Rosti; Pia, Giuseppe; Tonoli, Andrea (2011). The Automotive Body: Volume I: Components Design. Springer Science & Business Media. p. 184. ISBN 9789400705135. ^ "Coupe vs. Sedan: What's the Difference and Definitions of the Body Styles?". www.automoblog.net. Retrieved 25 November 2018. ^ "Range Rover's $295K Coupe SUV Proves No Niche Is Too Small". www.wired.com. Retrieved 25 November 2018. ^ "1962 Rambler Brochure". oldcarbrochures.com. pp. 6–7. Retrieved 9 September 2015. ^ "Definition of sedan". www.oxforddictionaries.com. ^ "Renault Voiturette Type B (1899)". www.speeddoctor.net. Retrieved 18 November 2018. ^ "Renault's first ever car attends Paris Motor Show". www.autoclassics.com. Retrieved 18 November 2018. ^ "Hardtop meaning". Engineering Dictionary. Retrieved 6 March 2018. ^ Thomas, Alfred; Jund, Michael (2009). Collision repair and refinishing: a foundation course for technicians. Cengage Learning. p. 164. ISBN 978-1-4018-8994-4. Retrieved 28 February 2013. ^ "Rambler has everything new - even a hardtop wagon". Popular Mechanics. 105 (1): 116–117. January 1956. Retrieved 28 February 2013. ^ Severson, Aaron (15 August 2009). "From Pillar to Post: More Automotive Definitions". www.ateupwithmotor.com. Retrieved 11 December 2018. ^ Cummings, Christopher (2014). Cadillac V-16s Lost and Found: Tracing the Histories of the 1930s Classics. McFarland. p. 50. ^ "1931 Chrysler Imperial Close Coupled Sedan". www.imperialclub.org. Retrieved 24 November 2018. ^ "1931 Chrysler Imperial Close-Coupled Sedan". www.rmsothebys.com. 22 July 2017. Retrieved 24 November 2018. ^ "1925 Duesenberg Model A Close Coupled Sedan - Amazing Original Car!". www.car-from-uk.com. Retrieved 24 November 2018. ^ "1930 Packard". www.sealcoveautomuseum.org. Retrieved 24 November 2018. ^ Haajanen, Lennart W. (2007). Illustrated Dictionary of Automobile Body Styles. McFarland. ISBN 9780786437375. Retrieved 24 December 2018. ^ "Club Coupes". www.hemmings.com. Retrieved 18 November 2018. ^ a b c Haajanen, Lennart W. (2017). Illustrated Dictionary of Automobile Body Styles, 2d ed. McFarland. p. 136. ISBN 9780786499182. Retrieved 25 November 2018. ^ Willson, Quentin (1997). Classic American Cars. DK Publishing. ISBN 9780789420831. Retrieved 25 November 2018. 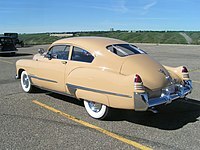 ^ "1948 Buick Series 40 Special Sedanet – Just A Few Inches Short Of A GM's Greatest Hit". www.curbsideclassic.com. Retrieved 25 November 2018. ^ "Fastback Fascination – 1949 Buick Model 56-S Super Sedanet". www.hemmings.com. Retrieved 25 November 2018.